Since 1907 this fantastic tournament for woman has been played over the Braid Hills golf course. Always a challenge of golf even with out the howling wind we had for the 18 hole foursomes qualifier on Saturday. The scores from the field of 52 couples (highest since 2017 centenary year) reflected the tricky conditions with only the top four pairs have nett scores in the 70s. 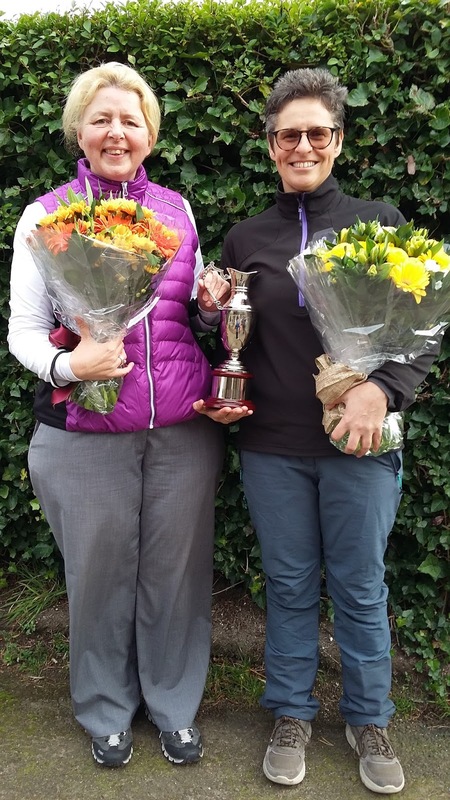 Harburn’s past Gibson Cup champions Linda Boyle and Dorothy Wilson’s 77.5 topped the field. Sunday’s matchplay semis were closely contested for the main Gibson Cup both went to the 16th and the 2nd. The Flight matchplay semis both finished at 17th. In Sunday afternoon’s final Viv and Tracy had clearly got the hang of the course and conditions giving them the edge. Despite losing the first hole and giving 4 shots over the match, Viv and Tracy played very steady golf with few mistakes and were 5 up by 14. Linda & Dorothy then rallied to take a conceded win at 14th and birdie at 15th keeper them in the match. However, still 3 up at 16 and the opposition already lost and 3 off the tee, Tracy could afford a brave line over the gorse finishing well down and in the middle of the fairway. One more solid shot into the green from Viv and the match was conceded and the impressive Gibson Challenge Cup Trophy was won. The 2nd Flight final was won by Barberton’s Wendy and Karen 2up at the 18th. Isla and Jen, of Turnhouse gave the two former tournament winners a very tight game which was all square after 16. Karen (scratch handicap) then showed a bit of her class at the par 3 17th with a very delicate chip down the green to within 3 inches, after all her partner Wendy had asked her to knock it close but not to go passed the hole as it had potential to run through the green! At 18 Wendy then repaid with a very solid approach onto the blind 18th green which was to be enough to seal the match and Claret Jug Trophy. Congratulation to Karen and Wendy but also very well done to Isla and Jen, a great showing considering this as with Tracy was your first time in the competition. The rest of Saturday’s foursomes pairing came out to play for the Stableford Consolation Salver in which Diane Moncrieff (Carrickvale) had a hole in one at the par 3 second hole. Congratulations to Letty Mackinnon and Fiona Jackson (pictured above) who won this with 34 points. 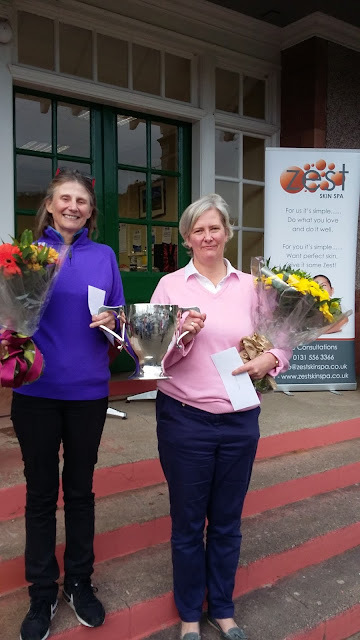 Huge thanks to Edinburgh Leisure’s Chief Executive June Peebles and all the golf team for having us all at the Braid Hills, to Murray at Golf Clubs 4 Cash and Louise at Zest Skin Spa for generously sponsoring this years event and to Mandy McBain for a power of work to get the Tournament running so well. Special thanks to all those who compete and make this such a fun weekend. 6th & 7th October 2018 is next year’s dates for your diary. Thanks go to Sal Shepherd for the report and photographs.